Maturity is overrated. I once saw this on a t-shirt and laughed out loud. I wish that were true in the real world! Wouldn’t it be great if your bank that it was overrated for you to pay your monthly mortgage? Or how about if your boss thought that it was overrated for you to actually do your job and instead invited you to sleep for the first half of the day so you would be better rested for the second half? Reality is not so kind, unfortunately! Maturity is essentially about personal growth. It is the process of leaving one station in life to move to a higher, better, more excellent one. Sometimes we choose maturity and sometimes maturity chooses us. And oftentimes, we don’t enjoy either experience. Yet, we always have a choice when life presents us the opportunity to move further down the maturity trail. This is where the “Maturity Prayer” can be useful. Maturity can be defined as, “full development or perfected condition”. In the case of the Maturity Prayer’s opening statement, “God grant me the maturity (full development, perfected condition) to accept what I am feeling", we are invited to accept our feelings as they are. This is especially difficult when we perceive them to be negative. It is a hard thing to do. We ask God to give us the ability to recognize and accept our feelings particularly as it relates to our part in creating those feelings. While it is true we may have strong feelings about a certain situation or person, place, or thing, the reality is the only thing we can change in life is ourselves. The prayer continues saying, “the courage to correct the actions that I took that made me feel this way.” This is the second and also difficult part of maturity, namely, correcting negative actions for which we are responsible. In the end, this prayer is all about asking for the power to better manage ourselves. While maturity may not be highly rated, we can definitely say that immaturity is definitely overrated. 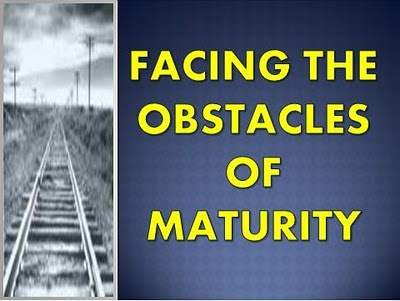 Which will you choose in the face of obstacles that threatened to stunt your maturation process? At The Coleman Institute, we love to help people get clean and stay clean. If you or someone you love is in need of detox from opiates, alcohol, benzos, Methadone, or Suboxone, please do not hesitant to call Jennifer Pius at 1-877-77-DETOX (33869). We are here to help you and yours get clean and stay clean!